Ailsby Collection: The honour badge of Loyalty Badge for the Dutch NSKK . The honour badge of Loyalty Badge for the Dutch NSKK . The honour badge of Loyalty Badge for the Dutch NSKK. Rarity – Extremely Rare, Extremely Rare, Extremely Rare. Loyalty Badge for the Dutch NSKK - Bronze - Obverse. 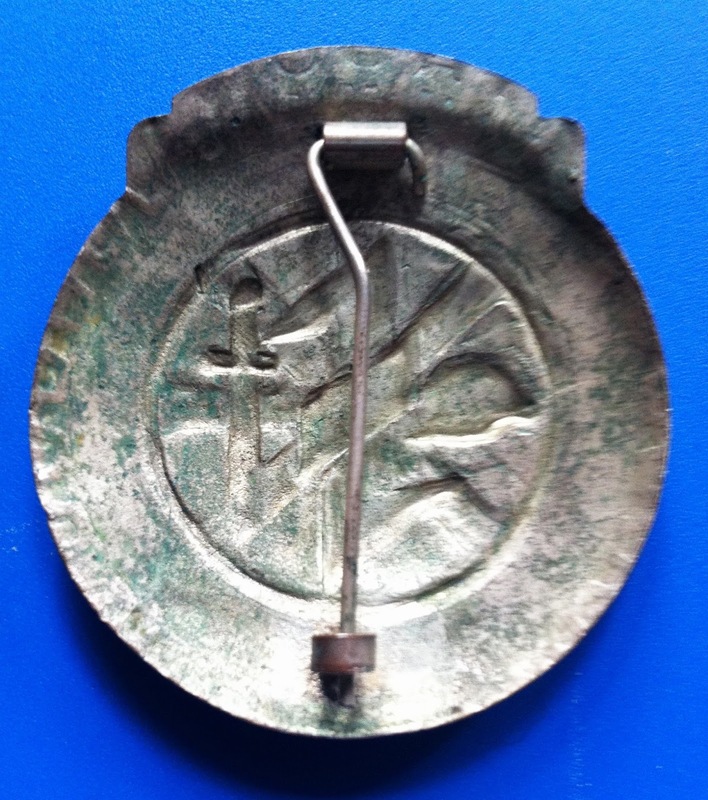 Loyalty Badge for the Dutch NSKK - Bronze -Reverse. 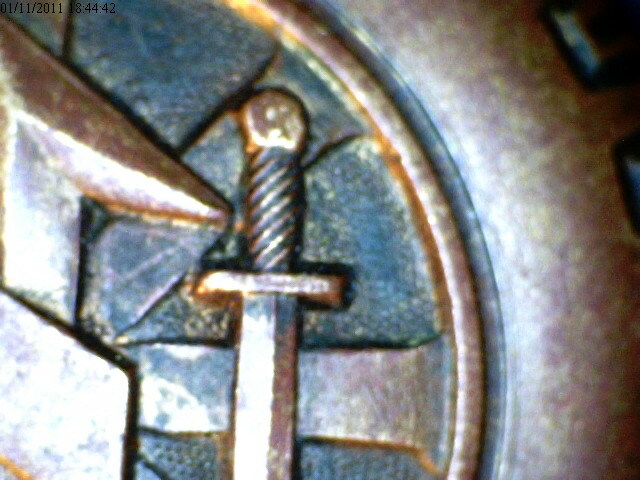 Loyalty Badge for the Dutch NSKK - Bronze - Sword close up. Loyalty Badge for the Dutch NSKK - Silver - Obverse. Loyalty Badge for the Dutch NSKK - Silver - Reverse. 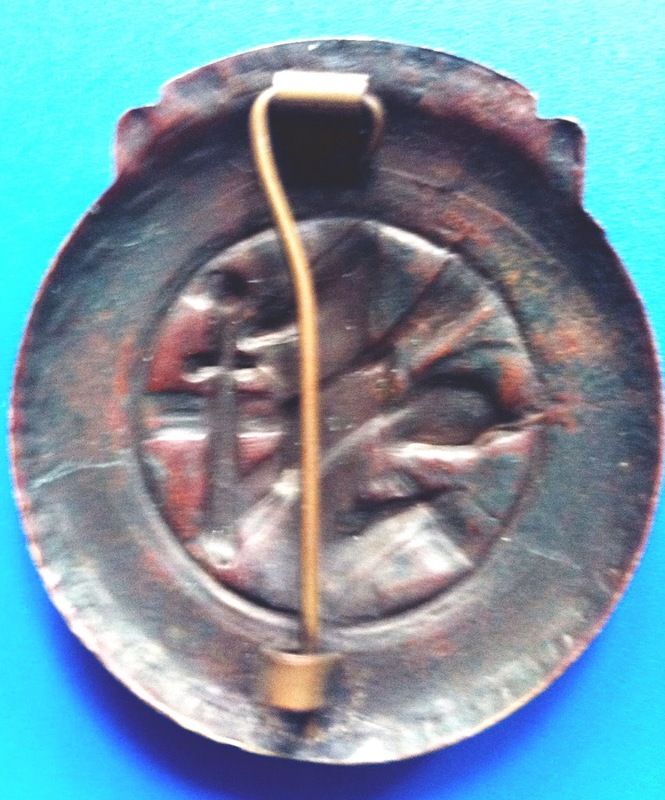 The badge is hollow struck from a thin copper alloy sheet that is 1 mm thick. It is 51 mm high by 47 mm wide and takes the form of a motor wheel with the 6 spokes. These are attached to a circler rim 1.5 mm thick. There is a 0.5 mm recessed line running round this and between the motor tire which measures 8 mm. The “Wolf hook” emblem of the W.A. in the centre is over the perpendicular spoke, flanked by a German steel helmet on the left and a downward pointing double edged sword on the right. The fields between the spokes are very lightly pebbled. At the top of the badge is a banner with fold at either end. Onto this in raised capital letters is the word, “TROUW” which translates to Loyalty. The reverse is hollow with an imprint of the obverse designed. It had a tube hinge for the thin vertical pin to pass through. At the base is an elongated “C” hook. There is no maker’s mark. 1) For those who served in the winter of 1941-1942, from November continuously for 6 months in Russia. (The persons that were also entitled to the German Eastern Front Medal). 3) For those who voluntarily presented themselves for the "wachtkommando" in Makajewka. The Loyalty badge in Silver was to be awarded only at Christmas. The names of the persons who were considered for the award were submitted for approval to the Dutch liaison Staff. The Gold class seems not to have been awarded. Also the criteria for this grade are not known. 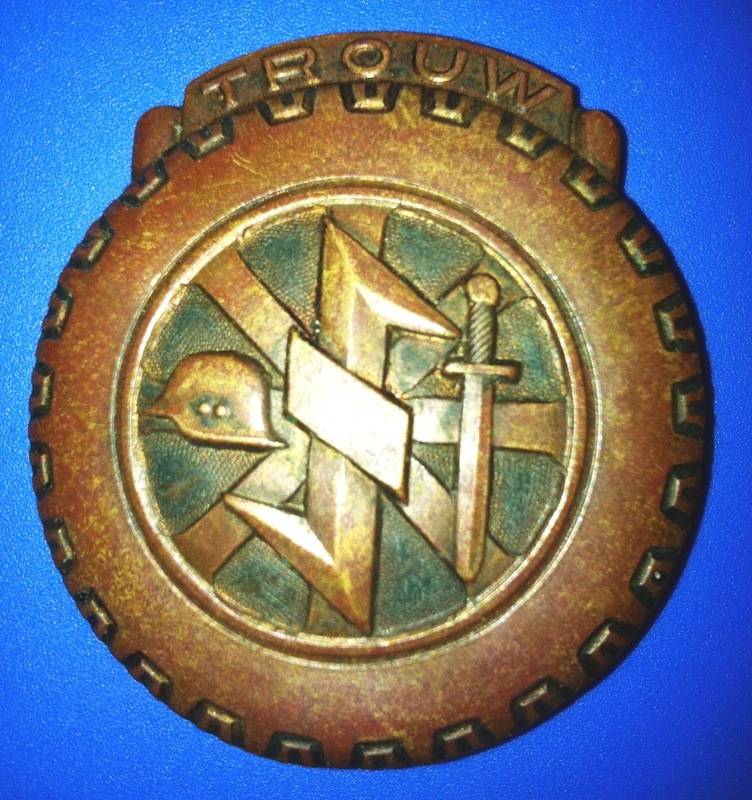 Loyalty Badge for the Dutch NSKK - Bronze in wear. 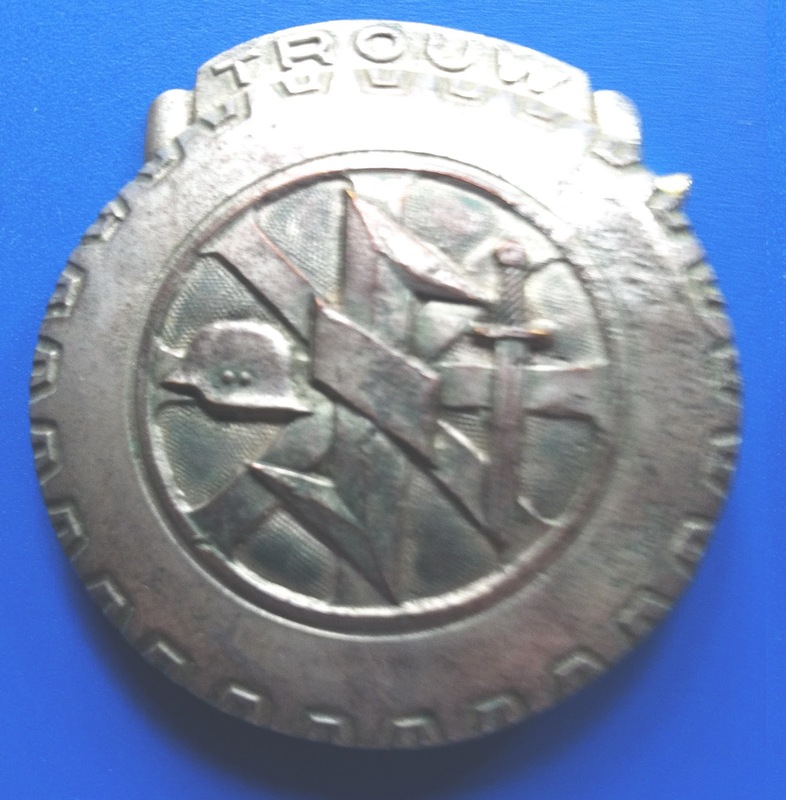 Loyalty Badge for the Dutch NSKK - Silver in wear. 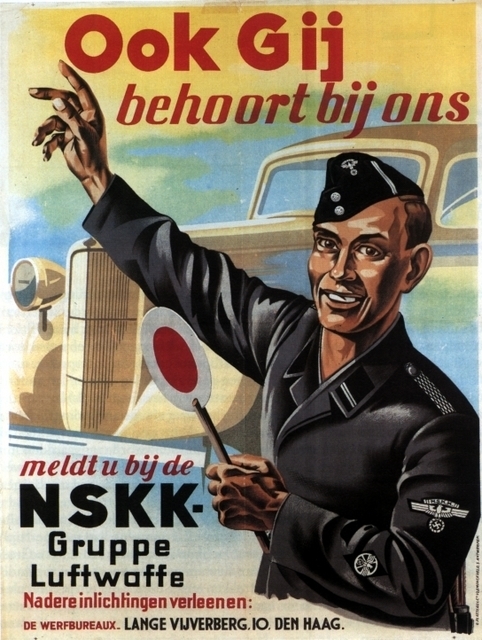 Recruiting poster for the Dutch NSKK., "You too belong with us. Join the NSKK - Gruppe Luftwaffe." Below this is the address of the recruiting office in the Hague. Dutch NSKK Volunteers Dog Tag. 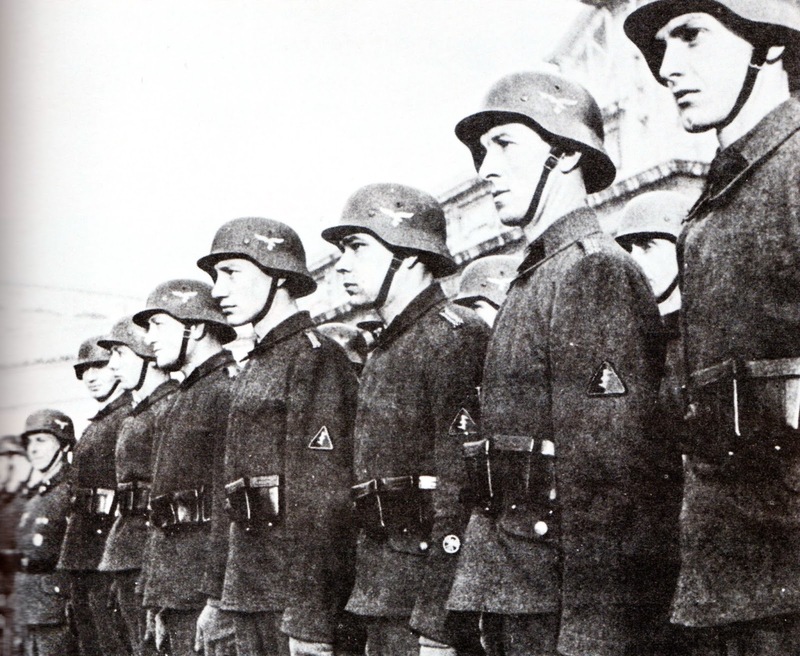 Most of the Dutch NSKK volunteers came under the jurisdiction of the Luftwaffe, with volunteers in the following formations NSKK Gruppe Luftwaffe, NSKK Staffel WBN, or Armed Forces Commander-in-Chief Netherlands, and NSKK Todt/Speer. 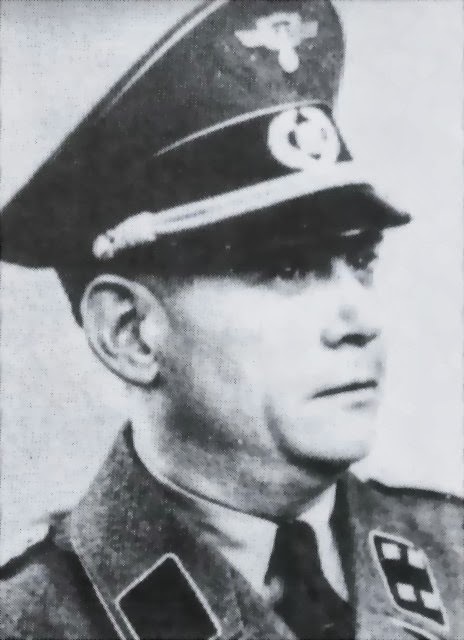 In January 1942 NSKK Gruppe Luftwaffe was created under Luftwaffe General Wimmer in Brussels which brought together under one command Dutch, Flemish and Walloon NSKK. The Dutch NSKK saw active service in Russia as the NSKK Regiment Niederland. 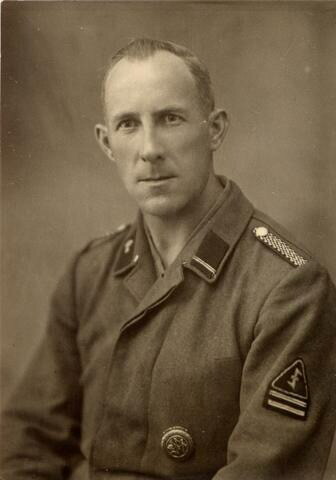 General Kraus reported to Goring on 6th August 1942, "We have thousands of Dutchmen in transport regiments in the East. Last week one such regiment was attacked. The Dutch took more than a thousand prisoners and were awarded twenty-five Iron Cross-'s." 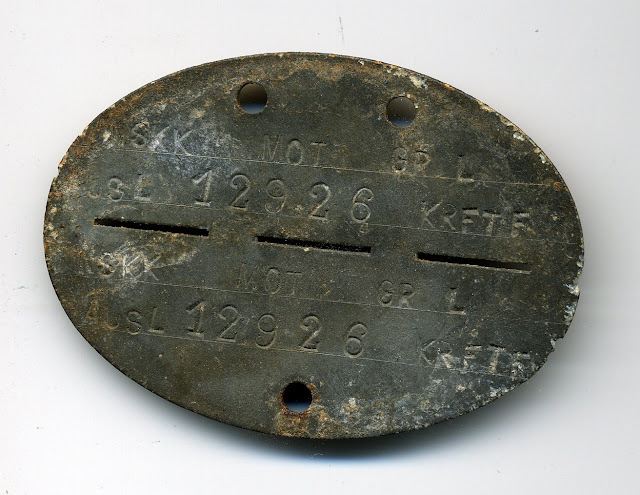 Scores of Dutch NSKK men fought and died at Stalingrad as part of the German 6th Army. In October 1942 the NSKK Todt and the NSKK Speer were renamed NSKK Transportgruppe Todt, latter NSKK Gruppe Speer and finally in 1944 Transportkorps Speer. The Transportactie and K.ű.K. were made part of the NSKK Staffel WBN in the autumn of 1943. Volunteers wore field grey with NSKK rank and other insignia and signed on for one year or the duration of the war. It is conceivable that eight or nine thousand Dutchmen served in the various branches of the NSKK. Dutch volunteers in the N.S.K.K. They wear Luftwaffe uniform with N.S.K.K. collar patches and shoulder straps. They wear as their "national badge" the arm badge of the W.A. 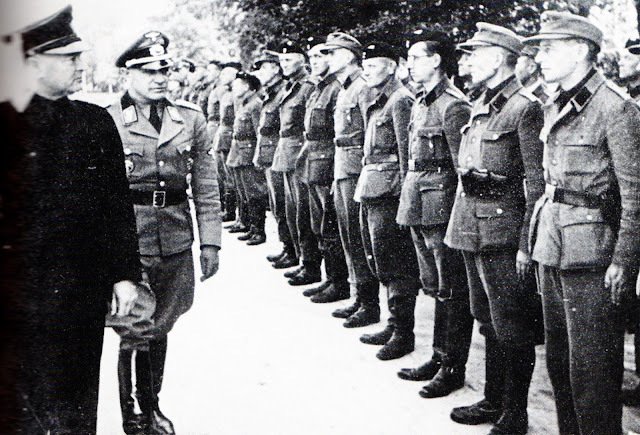 Mussert inspects N.S.B. volunteers in the N.S.K.K. Staffel W.B.N. Transport Unit of the German Commander - in - Chief Netherlands. 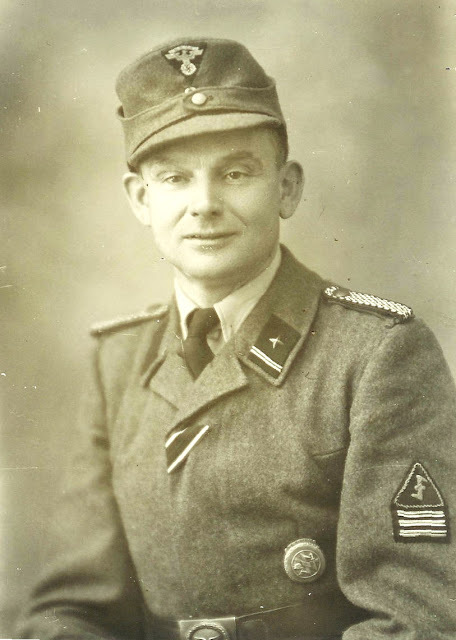 Renaat Rits - Staffelführer Flemish liaison officer between the VNV and NSKK - Transportgruppe Luftwaffee.